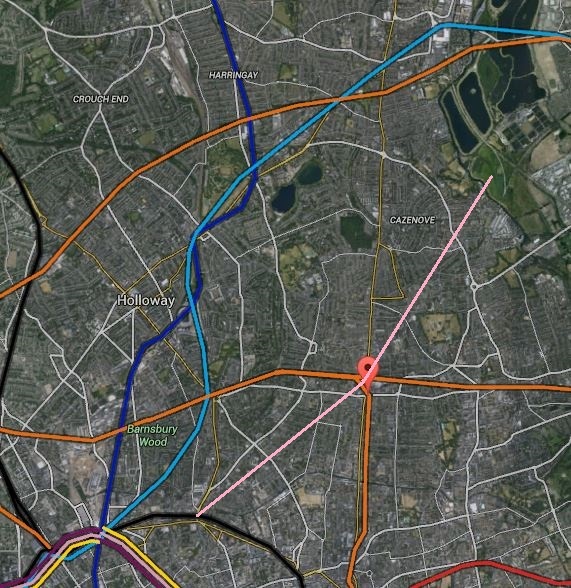 Look at this map of the rail and Underground lines in East London going north around Dalston Junction. 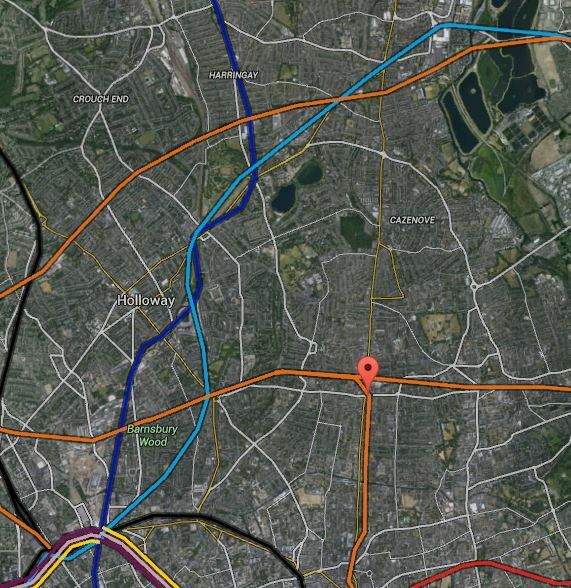 The light blue,dark blue, black and orange lines are the Victoria, Northern and Piccadilly lines and Overground respectively. Stations to note are. 1. Dalston Junction which is marked by the red arrow. 2. Tottenham Hale at the top right and is shown in more detail on this larger scale map. 3. Seven Sisters is the next station as you come south-westerly from Tottenham Hale and is marked by both tube and national rail symbols on the second map. 4. Below and slightly to the right of Seven Sisters is South Tottenham on the Gospel Oak to Barking Line. 5. On the original map, Angel is towards the left at bottom, approximately south west from Dalston Junction. This is a larger scale map of the area. In this map, Angel is close to the bottom left. Note how you can see Highbury and Islington, Essex Road and Canonbury stations north of the Angel and Haggerston and Hoxton stations south from Dalston Junction on the East London Line. Roads, like Essex Road, Balls Pond Road and New North Road are visible, as is the Regent’s Canal. From the limited information that has been published about Crossrail 2, I believe that the New Southgate branch will pass under Seven Sisters and very close to South Tottenham before meeting the other branch from Tottenham Hale somewhere near Walthamstow Marshes shown on Map 2 and in detail below. The map shows how Walthamstow Marshes could also make an ideal site from where to build the tunnels. 1. It is a spacious site with good road access, where the running tunnels to New Southgate, Tottenham Hale and Central London may all meet.So if a big deep shaft could be dug here, as Crossrail 1 did on the Limmo Peninsular, it could be used to launch and retrieve the tunnel boring machines (TBM). Looking at how far the TBMs went from Limmo to Farringdon on Crossrail 1, which is a distance of 8.3 km, I suspect that their successors on Crossrail 2 could go a long way under London and given the right ground conditions, perhaps even all the way to Wimbledon. 2. The site is close to the West Anglia Main Line and surely this could be used to bring in heavy equipment and materials. 3. 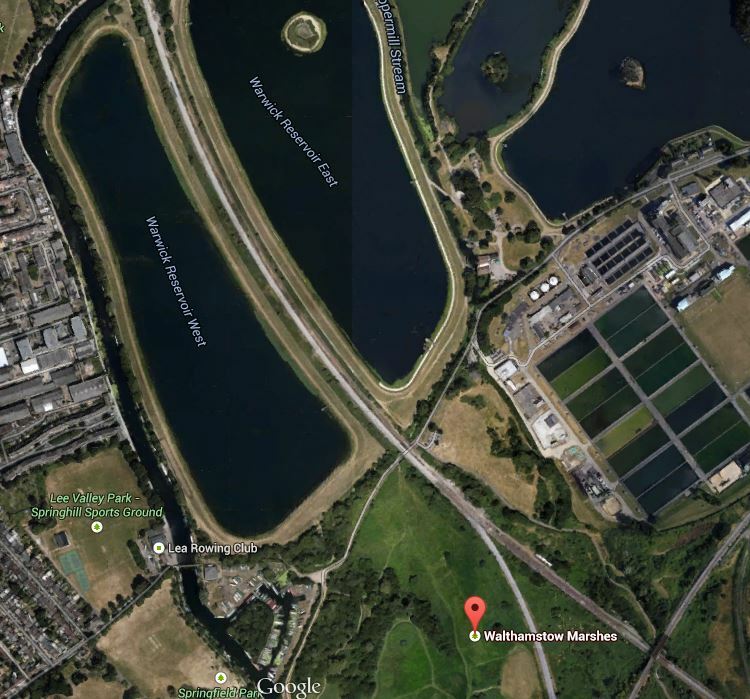 Around the west of the Marshes, the map shows the River Lea, which could be another transport artery into the site. 4. As there are several reservoirs there is plenty of raw material for the drink that builds the railways; tea. 5. The one problem is that the Marshes are a Site of Special Scientific Interest. But having seen how Crossrail 1 handled the potentially tricky situation at Stepney City Farm, I suspect that if they follow similar rules, then an amicable solution can be found. 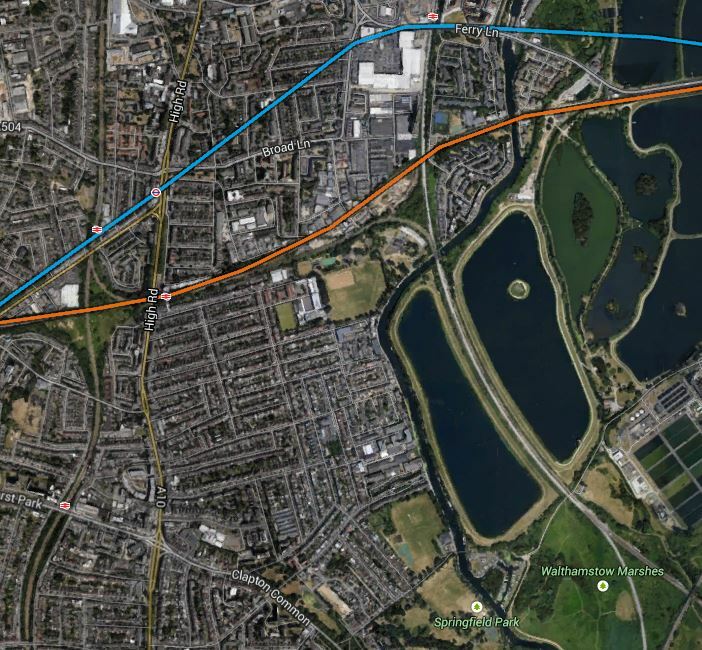 From the junction near Walthamstow Marshes, Crossrail 2 has said that the line will go to the next two stations; Dalston Junction and the Angel. This would mean that the line would run roughly north east to south west from the junction of the two branches of the line to the Angel. Whether it is aligned under a road, a railway or even the Regent’s Canal, would obviously be a matter for the engineers. On this map, I have drawn the possible route in pink. Not shown on Map 4 is the line of the Channel Tunnel Rail Link, which runs in a tunnel underneath the North London Line. I believe that it might be possible to dig the tunnel so that it passes underneath both Dalston stations, despite the presence of the Channel Tunnel Rail Link. In this respect, I have great faith in the ability of London’s finest hole diggers to navigate correctly and not connect New Southgate and Tottenham Hale to France. One of my Google Alerts today, picked up this article from the Hackney Gazette, entitled Crossrail 2 threatens another Georgian terrace in Dalston. As someone who lives close to Dalston Junction and whose roots are very much in the area, I want what is best for the local area. I also have my own list of buildings that should be saved. So I went down to Dalston Junction and took pictures of the area between and around the two stations, starting just south of Dalston Junction and then walking north, picking up some shopping in Sainsburys and having a coffee in fed on the way. Quite frankly, I think that for most of the buildings, only some of the frontages and some interiors like that of the former eel and pie shop, are worth saving. But as my pictures show the two main problems in the area are the movement of large volumes of both vehicular traffic and pedestrians. As I don’t drive, I have no personal interest in the former, if the buses still get through. But I regularly walk up and down the Kingsland Road to Sainsburys, Boots and the Market. The pavements are a nightmare, as they are narrow and very busy. The new Dalston Junction part of the solution to the walking problem has been built, with a draughty but rain-free passage between the two station entrances. So wouldn’t it be nice, if this passage could extend up to at least Dalston Kingsland station? If it did it might be a traffic generator for the underused bus station, which could do with more routes. A passage would of course make the interchange between the two stations easier. At least the Kingsland Shopping Centre is proposed to be redeveloped to a more modern layout. Pictures in the link, give hope that there could be a traffic-free route from at least Kingsland station to Dalston Lane, which somehow has to be crossed. The current arrangements of a light-controlled crossing works, but could be improved upon. The walking link between the two stations will hopefully be improved when the new Dalston Kingsland station is rebuilt, as someone from London Overground indicated to me it will be, a few months ago. Could something bigger be rolling through Dalston? Something is and it’s called Crossrail 2. In one of the pictures it shows a sign at Dalston Junction station, showing that it is 250 metres between the two stations. I will make an assumption here, that Crossrail 2 will use the same Class 345 trains and platforms matched to their size as Crossrail 1. I think it would be a reasonable assumption to make, as this would mean a common fleet and a lot of repeated platform design. And how long are the platforms on Crossrail 1? They are 260 metres long. So would it be possible to fit a double-ended station for Dalston, that avoided the Channel Tunnel Rail Link and was connected to the platforms at the two Dalston stations at each end? I don’t know as I haven’t got the detailed dimensions, but the last time London Overground threaded a rail line under Kingsland High Street, they managed it without mishap. If the station followed the traditional hump-backed design, then it would rise up to the platforms, which would be deep under the area and could be connected to the two stations by escalators and lifts. If the Crossrail 2 station had a wide centre platform between the tracks, then it could also be used by passengers transferring between the two stations. The platforms would have platform edge doors, so there would be no safety or draught issues. It might even be possible to make the central Crossrail 2 platform wide enough for a cafe, kiosks and an information office. The design would have advantages for passengers. 1. 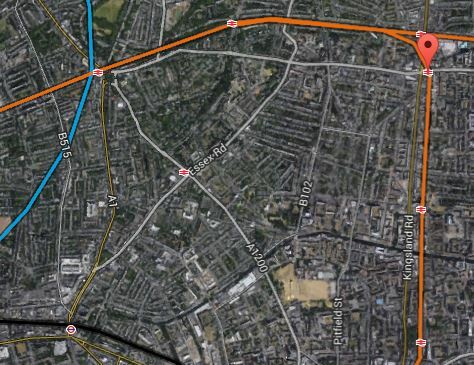 It would give full interchange between the North London Line, East London Line and Crossrail 2, which would make so many more journeys possible, like for example Turnpike Lane to Homerton or Shoreditch High Street to Ware, with just a single step-free change. 2. Dalston Junction is the first station on Crossrail 2, after the two northern branches have joined, so just as at Whitechapel on Crossrail, you could come down one branch walk across the platform, perhaps picking up a coffee on the way, and get on a train up the other branch. 3. In the case of an interchange between either the North or East London lines and Crossrail 2 it would be up or down on an escalator or in a lift, but between the East and North London Lines, you would have a nearly 250 metre walk as well. But the walk would be easier and more pleasant than the current one on the surface. 4. Would the ability to transfer at Dalston between the North London Line and Crossrail 2 serve Hackney sufficiently well, so that the need for the possible Hackney branch of Crossrail 2 could be delayed? 1. As the interchange between the East and North London Lines is now a safe walk out of the weather and traffic, would this be a good enough connection to make it unnecessary to reopen the Dalston Eastern Curve, thus releasing this land for something better in perpetuity. 2. But the great advantage of this plan to Dalston, is that it doesn’t require any demolition of buildings on the surface, except for the unloved Dalston Kingsland station. 3. Dalston Junction station already has a building that is big enough, but could you do away completely with buildings at Dalston Kingsland station? You might just have escalators ending level with the street and a simple glass front like the new Tottenham Court Road tube station. The money saved on the building could be used to add extra escalators and lifts. Perhaps on both sides of Kingsland High Street. I probably have all this totally wrong, but I believe that Crossrail 2 could be a bigger opportunity for Dalston, if a double-ended station is built to serve both Junction and Kingsland. It is only possible because the Victorians had the foresight to build the two Dalston stations the same distance apart as the length of a Crossrail station.